Hello there, pixel lovers! I hope your digital journey so far has been full of opportunities at every step. I´m covering today a very important pillar of design: fonts and font pairings. So this post is for sure a good read for all of you interested in creating a strong brand for your business or even for those of you looking for inspiration for your clients. I look at fonts and typography as being a cornerstone to any business. Getting some basic knowledge about what goes well together is a must in today’s digital world. But font pairing can be indeed tricky if you are new to design. I´ve put together a brief explanation, some tips and examples on how to pair fonts. Limit yourself to 2 or 3 fonts. Adding more than this can make your blog look amateurish, plus it can become very hard to read. Use one font for headings and sub-headings, one font for the body of text and an additional one just if you want to add an extra accent to your blog. Alternate font weights for contrast. You can even use the same font for a heading and the body of text if, for example, you make the heading bold and the body of text thin. 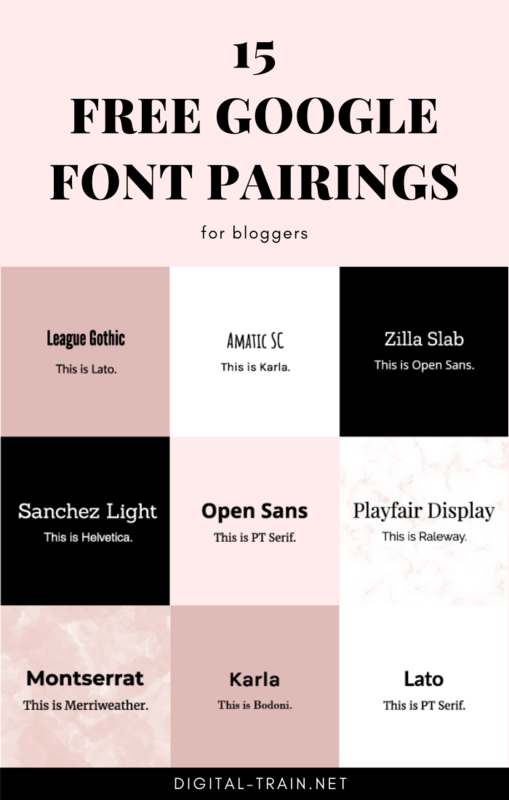 Look for fonts on sites like Google Fonts, Adobe Fonts, Fontsquirell, MyFonts and for inspirations on font pairings on TypeWolf, 100DaysOfFonts, typ.io and Font Pair. Check out the amazing resources on Canva. You can use their online tool to generate your own font pairing. If you want to get more in-depth info on fonts, check out their Work with fonts resources. Just for fun, check out 36 inspiring quotes on typography that every designer should live by. I have created a list that I believe works great for blogging. I recommend using the first font for headings and subheadings and the second one for the body of text. Feel free to try any of these on your blog. All of these are free google fonts you can download on Google Fonts.